KARACHI: Balochistan has been a victim of external belligerence and internal mismanagement causing some general and perceived grievances to emerge. 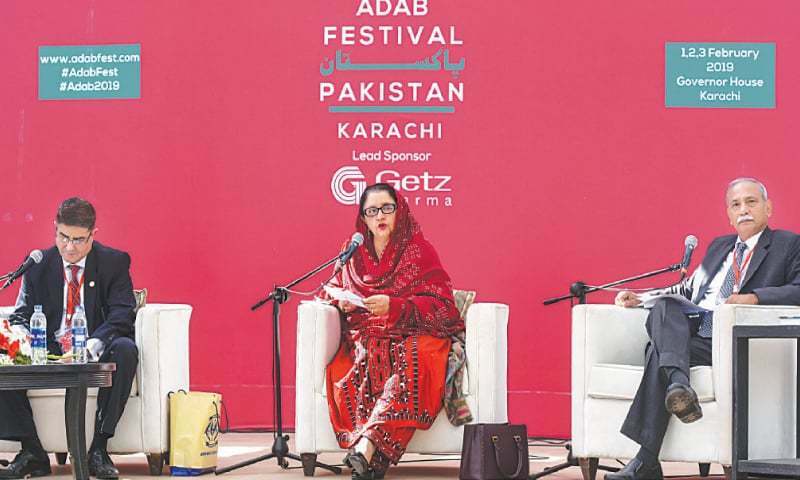 This was stated by General Fida Hussain Malik, the author of Balochistan: A Conflict of Narratives, which was launched at one of the pre-lunch sessions of the on-going Adab Festival on Saturday. Balochistan, he said, is the largest yet the least developed province of Pakistan. It has strategic importance and lies on the cusp of Indus, Persian and Central Asian civilisations and possesses an immense wealth of minerals. Unfortunately, despite being the largest province, it remained the least developed, regretted Gen Malik. It had been a victim of external belligerence and internal mismanagement. Its strategic importance had attracted global attention subjecting it to a hybrid war with hostile intelligence actions by unfriendly countries. Internally, its development had been affected because of negligent policies and vested interests. The Baloch society still faced challenges such as absence of basic amenities, insecurity, seditious activities of various outfits and foreign militants. This had resulted in inflicting a psychological trauma to the public. Gen Malik said the state today had realised that the prosperity of Pakistan was contingent upon development in Balochistan. It was Islamabad’s top agenda in Pakistan Vision 2025, he said, adding that China-Pakistan Economic Corridor had emerged as Pakistan’s route to prosperity which can’t be imagined without Gwadar Port. The author said while writing the book as the voice of the Baloch he knew that he had to be unbiased and dispassionate in order to know what happened between the province and the federation. He chose to talk less about geography and more about the sentiments. He mentioned [in the book] the narratives of the federation vis-à-vis the province; narratives of sub-nationalist; militant outfits; and tribal chiefs. He wanted to be unbiased so that the state could be told that the problem does exist and has developed into a malady. After thanking a lot of the people from the province for giving their inputs for the book, Gen Malik thanked the army for allowing him to write on a topic which was largely perceived as a closely guarded secret. He added that readers would find a lot of confessions in the book about wrongdoings and neglect, and the first step towards problem-solving was to admit that mistakes were committed. Over the years there had been discussions on federation-versus-province, the people of Balochistan-versus-people of Punjab because the establishment was comprised mostly of civil servants of Punjab. So the perception was that whenever anything went wrong it’s the people of Punjab making the people of Balochistan suffer, which was not true, she said. Tariq Khosa said he took pride in the fact that since the 1970s he had been the only Baloch inspector-general of police of the province. A book coming from a serving major-general reflected glasnost within the armed forces that they had allowed their military officer to write a book. It was a pleasant surprise, he remarked. Mr Khosa said the book is rich in history and its perspective about Balochistan is worth reading. Mr Khosa said that he was a firm believer in the fact that people should be careful in using terms such as terrorist or insurgent. “Our own people may be misguided but they must not be dubbed terrorist straightway. It’s not a war. You have to see a situation from a different perspective as to why it’s happening,” he said. Mr Khosa said Balochistan was Pakistan’s future. Having sub-nations of such nature was our strength. Rounding off his address, he said the country needed to look at what the Baloch sub-nationalists were demanding. The launch was moderated by Omayr Saiyid.